Every day is Margarita Day at Margaritaville, but we’re rolling out some special celebrations in honor of our signature beverage on February 22nd – National Margarita Day! In honor of National Margarita Day, we’re giving away 25 Margaritaville Bahamas Frozen Concoction Makers! Look for entry in participating restaurants and hotels, or enter online here! See entry page for the official rules. Try our new Coconut Key Lime Margarita before anyone else, starting on National Margarita Day! It’s served with a graham cracker rim, and we’re featuring it this week only, at our Margaritaville Caribbean locations! One day only on February 22, in honor of this extra-special holiday, Margaritaville Hollywood Beach Resort is offering a special booking blitz. 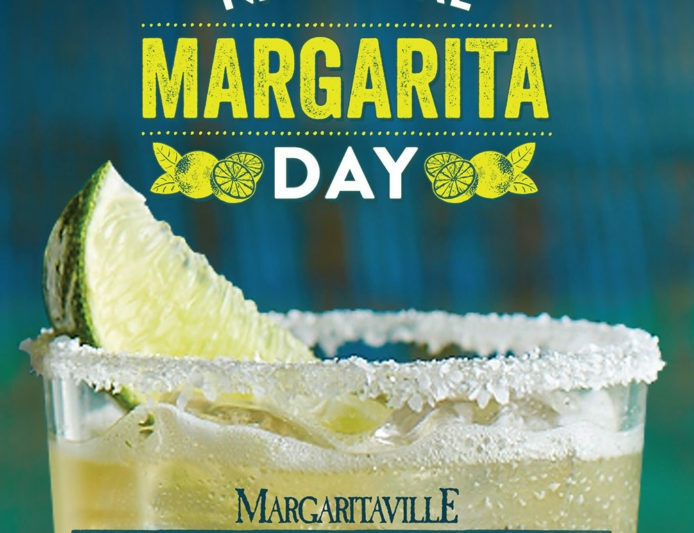 Those booking the National Margarita Day Package on the 22nd, (valid for travel anytime within the next 12 months, other than select blackout dates), will enjoy coastal-luxe accommodations, two welcome margaritas, and breakfast for two in Margaritaville Restaurant. Nightly rates start at $295. Book here on February 22nd! In addition, the new St. Somewhere Spa at Margaritaville Hollywood Beach Resort is discounting its popular Lost Shaker of Salt Scrub treatment, which comes with a complimentary margarita, by 15%. Those booking the treatment for the 22nd will receive the $21 discount, complimentary margarita and a free day pool pass to experience the resort’s Lone Palm pool and/or LandShark Pool. This is a total savings of $55. To make spa reservations, call 954-874-4430. One night’s lodging in a spacious River Double Queen Room with a private riverfront balcony, fireplace, wet bar & bathroom with rain shower. Also included is our Margarita Package for your in-room Frozen Concoction Maker, with a pint of tequila, carafe of mix, fresh limes & salt, a $25 Credit to our Changes in Latitudes Bar, and 50% off Spa Services on Monday & Tuesday! Call 865-774-2300 for reservations. Our St. Somewhere Spa in Pigeon Forge is offering 50% off all spa services Monday-Thursday during the entire month of February! All spa guests can receive a coupon for a Buy One Margarita, Get One Half Off in our Changes in Latitudes Bar with every spa service! Call and schedule your spa services, and prepare to Escape to Paradise by calling 865-280-6200 today! Be sure to mention the National Margarita Day Spa Special when making spa appointments. Kick-off the weekend with Margaritaville University where you can learn from our master mixologist how to make specialty margaritas including; Margarita Float, Sparkling Margarita and Spiced Passion Margarita. Plus you’ll get to sample all of these masterful creations! Margaritaville University Saturday 2:30pm at the Tiki Bar *Get your Margaritaville University Diploma after the class! Monday IS National Margarita Day! Enjoy $4 margarita specials all day PLUS we are giving away a Frozen Concoction Maker at 5 o’clock in the gift shop. Sign up all weekend for the give-away or online here! Don’t forget to mention “Margarita” when you check in to receive a pair of margaritas! Tune in on February 22nd and share a toast with us to National Margarita Day! We’ll be bringing you exclusive drink recipes from our bartenders at our Cafes around the world, and of course plenty of extra party music for you to enjoy! Forget that this Monday is a Monday…it’s National Margarita Day on SiriusXM’s Radio Margaritaville! Watch HSN on February 22nd, as we celebrate National Margarita Day throughout the day! Check out the schedule lineup, or shop HSN online anytime. Celebrate National Margarita Day at home, and save $120 on the Margaritaville Bali Frozen Concoction Maker for a limited time. It’s the coolest drink machine this side of paradise! Fully automatic from start to finish, this Frozen Concoction Maker shaves, blends and serves drinks for non-stop party action! Also, from our Avo Margarita to our signature Frozen Margarita, check out some recipes to make your National Margarita Day celebration special!